Nash and Rochette were in a class of their own on the dark slopes of Night Weasels. 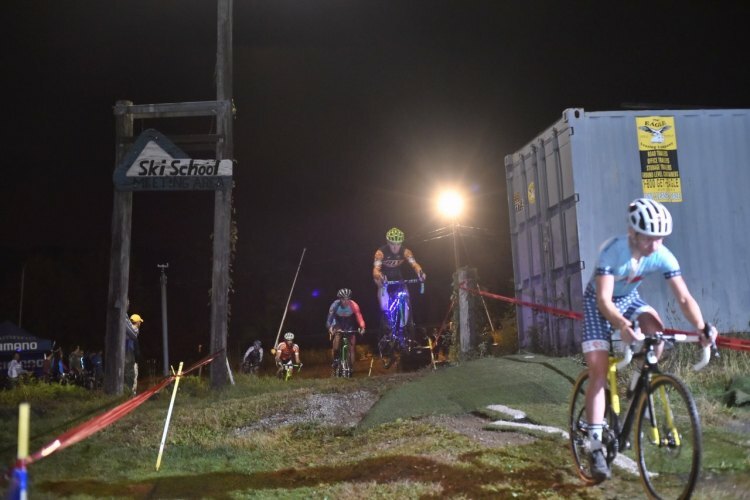 SKI WARD SKI AREA, SHREWSBURY, MA – The New England Holy Week of Cyclocross headed into the darkness Wednesday night, with weather conditions changing drastically from the weekend’s dust bowl at Gloucester. 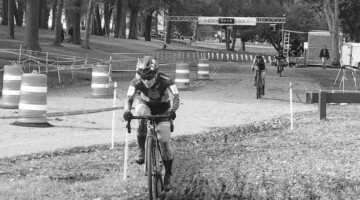 Nearly two inches of rain fell overnight, so the mud tires were out and “real cyclocross weather” arrived, as over 400 racers gathered to race up and down a dark, slippery ski hill 40 miles west of Boston at The Night Weasels Cometh. 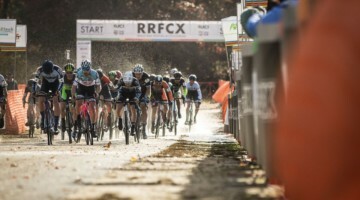 The Women’s Elite field was the strongest in the event’s history, headlined by LUNA Pro Team riders Katerina Nash and Maghalie Rochette, as well as Emma White (Cyclocrossworld Devo) who took her first cyclocross ride of the season, after a second place at Junior Road Worlds in Richmond last week. The LUNA riders wasted no time stamping their authority on the race, with Rochette taking the holeshot ahead of Nash. 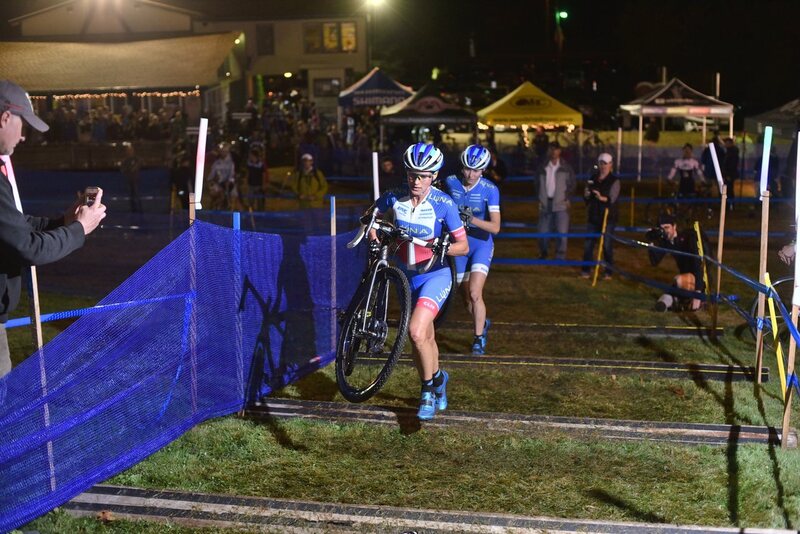 They were chased by Kate Northcott (West Hill Shop), White, Gabby Durrin (Neon Velo) and Kathleen Lysakowski (Joe’s Garage CX pb BikeReg), but by the end of the first lap the duo established a gap that would only grow for the rest of the evening. Defending champion Rochette, led Nash for much of the night, but the current World Cup leader was never more than a few bike lengths back. 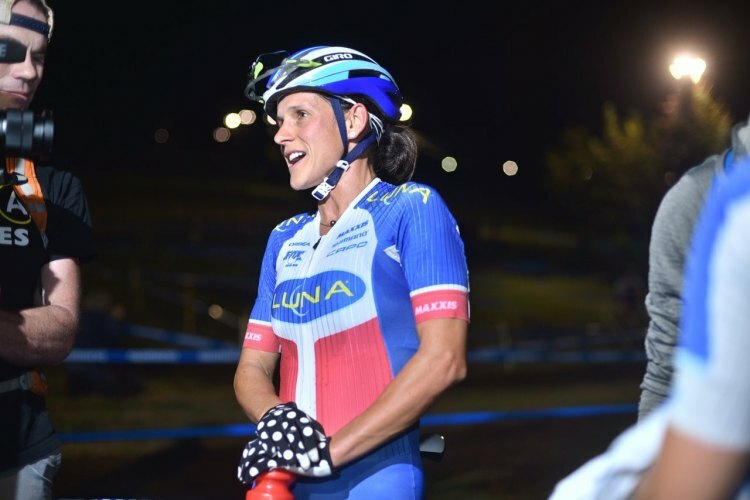 With just over a lap to go, Nash launched an attack on the biggest climb that Rochette couldn’t match, and notched her second major night cyclocross victory of the year. 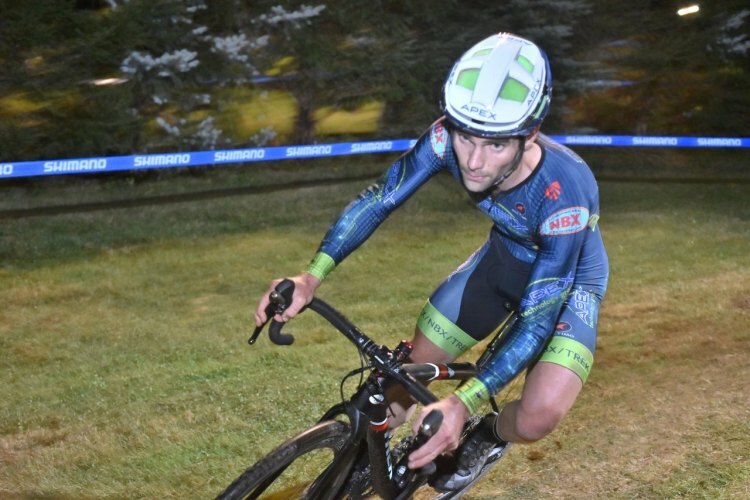 Afterward, Nash was all smiles — “I can’t believe how many people are out here on a Wednesday night… I think I’m going to become a night race specialist,” she quipped. As the chase group splintered on the relentless course, Northcott dropped her challengers to ride onto the last step of the podium. 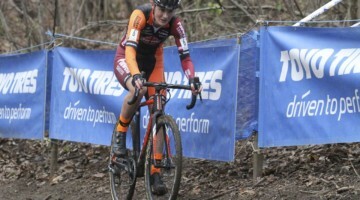 Emma White survived a spectacular, stake-crushing crash to roll in fourth, with Lysakowski narrowly holding off Jessica Cutler (Jamis) for fifth. The Men’s Elite race also featured record depth, with five-time winner Justin Lindine (Apex/NBX/Trek) facing his toughest title defense yet against the likes of Ryan Trebon (Cannondale/cyclocrossworld), Tobin Ortenblad (Cal Giant/Specialized), Cody Kaiser (Lange Twins Specialized), Michael Van Den Ham (Red Truck), Jeremy Martin (Louis Garneau), and a host of other UCI-points-holders in town for Holy Week. Ortenblad took the holeshot ahead of Lindine, with a surprising gap to the rest of the field, led by Trebon. By the time the leaders emerged from the darkness on lap two, though, order had been restored with Lindine now pushing the pace and Ortenblad struggling to follow. 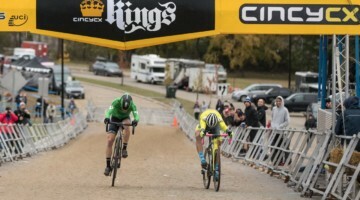 Trebon continued to lurk, leading a chase group of Van Den Ham, Mark McConnell (Hot Sauce Cycling Club), and Ben Frederick (beyondCX). The demands of riding at Lindine-speed on a dark and bumpy course became apparent, with first Trebon, then Ortenblad succumbing to flat tires, while Van Den Ham laid waste to course tape as he found the limits of traction several times. Frederick added to the mayhem with a tilted saddle after a remount, which left a clean-riding McConnell clear in second. Just like every year, though, once Lindine had a gap he never relinquished it, threatened more by delirious lapped riders than chasers as he led solo for the rest of the night. A surging McConnell came through in second, with Frederick in third to round out the podium. 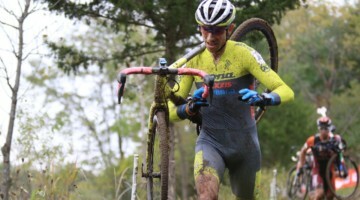 Trebon, no stranger to chasing after flat tires this year, came out of the pit deep in the scrub zone—giving a few cat 3s pictures they can treasure for a lifetime — but was soon closing in on the leaders, and the race was between him and lap cards. 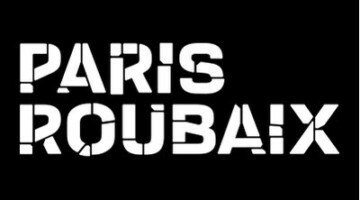 He tore into the top ten and came out victorious in a furious final-lap battle with Van Den Ham to finish fourth on the night. After a late night race with a bustling beer garden, you might think that a few days to recover would be warranted, but many of the amateur racers are headed to the KMC Cyclo-cross Festival in Providence on Friday, barely 36 hours after the close of Night Weasels. If you’re making a pilgrimage to Holy Week, there’s no time to rest.